Gary Justice Business Excellence Award winners are named each year by the Nacogdoches County Chamber of Commerce Board of Directors and honored at the Annual Meeting and Membership Banquet. Honorees are proven leaders in their industries and have positively impacted the business community. 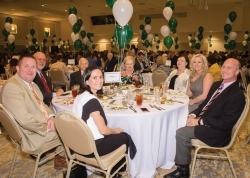 Non-Profit of the Year recognizes active organizations with a proven record of demonstrating community consciousness with civic/community involvement.